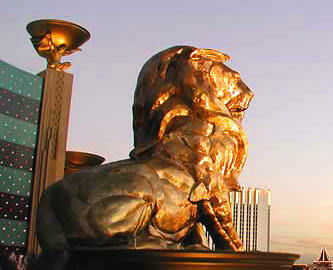 One of my pet symbols: The solid bronze lion statue in front of the MGM Grand Casino, Sin City - Las Vegas, Nevada. Our modern day Sphinx in the desert. I've been reading in the news logs about the recent propositions for the mining of gold to establish a NCN Community. I have the following comment on the implications of gold, and our course into the future as I see it. What is Gold? It is a rare precious metal that occurs as a stable element on our planet. Astrophysicists inform us that the process of nuclear fusion in the core of a deceased star(s) created it (along with every other element found on Earth) many billions of years ago. Gold has special electrical properties that make it the medium of choice in many electronic components. Its malleability makes it suitable to for use in dentistry and jewellery construction. It has always been collected and made into ornaments and charms, and adorned by its owner who often felt more regal and imposing than others. It is shinny and looks nice. Being rare, ownership represents wealth and power. It is an object of possession and there have been many ordeals and battles fought to acquire and appropriate it from others. For example, the plight of the Native Americans under the conquest of the Spanish conquistadors. The Aztec Indians mistakenly mistook the conquistador Cortez as the returning white God, Quetzalcoatl. Cortez ruthlessly took the upper hand and captured their king, Montezuma, and demanded a room filled with gold as ransom for his return. The room was eventually filled with all the gold demanded but Cortez executed the Montezuma anyway, leading to the demise of the Aztecs. Unable to appreciate the aesthetic value of the gold collected, Cortez simply smelted it all down into ingots for easy transport to be shipped away to finance further projects of conquest. The domes of some state capital buildings have millions of dollars of gold leaf etched over their surface proclaiming the wealth and prosperity of the region. There is the fable of King Midas who was granted his ultimate wish of turning everything he touched into gold. He found out pretty smartly that gold could not be eaten (among other things) and that his unlimited gift was indeed a curse, and would do anything to have his wish vanquished. The bulk of the world's gold is stockpiled as bullion in secure vaults, like Fort Knox, never to be touched. It is used, by the powers that be, to gain increasing profits as investment, maintain economic dominance against competing nations, manipulate inflation and to hoodwink the masses. Exercises in absurdity I only have a vague impression of. Then there is the legend of the Philosophers Stone. The alchemist's symbolic search for a substance that will transform base metals into gold. It is actually an inner quest of self transmutation with the promise of eternal youth, which I interpret as the endowment of higher consciousness. In the mining for gold news logs I read that members are being called for as investors to finance a venture to mine gold on a claim in Nevada. That these earnings will be engaged to establish a NCN community, with greater profits being awarded to founding investors. Already I have a sense of a community that will simply mirror our current societal system with a hierarchy of privilege based on personal wealth. I don't feel that NCN and its membership needs to be actively mining for gold. To continue the mindset of gratifying everything gold stands for and perpetuates. All we need is people's time, energy and effort, which anyone can contribute. And to be open and ready for possibilities as they present themselves. That leads to my question: What should NCN and its members be pursuing in this area, doing in preparation for the future, at this point time? I don't know, and can't answer. I can only comment on what I feel I should be doing, convey my impressions, and present my vision of the future and what it can become. There are currently many forces at work that will undoubtedly have significant repercussions impacting on our future. The Earth as a whole can be viewed as an organism in itself. It is under attack by human race, which can now be regarded as a virus wreaking havoc over its surface. As with most organisms, antibodies of some form will be produced to counter an infection and work to regulate a status quo. This is a natural course of movement to maintain balance through processes of homeostasis and survival. Just like the weather: cold air moves to displace hot, high air pressure moves to increase low, moisture rises to descend downward again. We have created economies and social systems that can only exist by continuously consuming an ever increasing amount of our natural resources that can only devastate the Earth. This now poses a threat to everything living on our planet. More production, more commodities, bigger this, instant that, the 'who has the highest standard of living' competition, in a never ending desire to escape our emptiness. Unabated consumption that is consistently being promulgated as success and happiness. It is creating an ever-greater pile of extravagance, nonsense and garbage as a total insult to our intelligence. It is obvious to me that this cannot be sustained, will not last, must certainly end, eventually grind to a standstill ending in chaos. It is also apparent that nothing of any consequence is being done, or is going to be done. We all just shrug our shoulders in implicit agreement, turn around, and carry on as usual with our daily toil. Earning a living, consuming, procuring, nothing changing, unwilling to think or act, as if zombies caught in a trance. Slaves ruled by the spectre of our wants and debts? Sure, there is some awareness. You have the EPA statutes, Kyoto protocols, World summits where dignitaries talk about it and have a nice party. Tokens of lip service of tacit condolence appeasing the symptoms of our actions, completely ignoring the root causes, pretending to alleviate our inevitable demise. At best, these actions will only prolong our agony. The whole core fabric of our social systems, the entire way we live, requires a deep rethink and complete overhaul if we are to survive as generations into the future. It is self evident that is never going happen by our own volition. There are dynasties and regimes that have too much vested into maintaining things as they are, in keeping their interests of power and control over all. There will inevitably be a course of trials and tribulations to come. There have been many social upheavals in the past, and assuredly there will be more to come in the future. Revolutions where the grass roots of society finally had had enough and took a stand to usurp those in control and redeem their autonomy. Revolution needs to be imposed but imposed with a notable difference. Not a revolution of violence, external conflict, of 'us' and 'them', and a struggle to get the upper hand. But an inner revolution that will involve every individual. A revolution of each discovering who they really are and what they can become. Resting on our modern technological advancements as having made so much applaudable 'progress', I find myself asking such questions as: Why do we have hospitals with so many beds predominantly filled with people having disorders which are psychosomatic in nature? Why do we have police, and prisons, and are permeated with people of unconscionable antisocial character? Why are so many of us becoming afflicted with the psychological malaise of obesity, and yet there are more people than ever before go to sleep at night still hungry? What is war really all about, and why do we have such overwhelming resources dedicated to our defence and destruction, which could otherwise be gainfully employed towards resolving our predicament? My invariable response is: Because people do not know who they truly are. And, the majority do not even know that they do not know who they are. If we each had an interest in, an inkling about, who we really are, I'm convinced we would act, as a species, quite differently. Little by little, step by step, you will find your habits and attitudes being acted out of concern for others and your surroundings. Inner space, like outer space, is a never-ending journey of discovery. I feel it is my role to point out people's present state of self-unawareness and to offer suggestions towards self-revelation. So that when the 'proverbial' hits the fan in the times ahead, people may remember, know where to look, be able work out what they should do in order for us to continue as a life form on the planet. Is human nature innate? If it is innate, can it change, be transformed? I dare say 'Yes, it can.' We are limited only by our imagination and creativity. Each one of us is an expression of God trying to discover himself. We are more than human beings having a material existence. We are spiritual beings undertaking a human experience. As I do agree with most of your post, I have to say, theres no gold in Fort Knox. As well I have to disagree with your take on the Earths human virus. I truly believe we will one day absorb food/energy from the air and water, maybe like osmosis, but for now we are here to consume somethings, granted we can live simply and consume much less than the majority does, I do pretty good, still it's a chicken a week, a fish here and there, and all the baby embrio seeds in the vegies I eat. The Earth was made for humans too, or we wouldnt still be here at all. Yes we are devine beings traped in flesh, so the world that you describe above, means to me that we are no longer in the flesh, a time when humans only exist in spirit, when we all are dead. I can't say too much about this idea, yet it's pretty interesting discussion indeed. great article i like it thanks for sharing it . 4 Jun 2010 @ 03:30: Hanging Out. 20 Oct 2007 @ 19:44: ANOTHER KIND OF EPIDEMIC... as dangerous as any! 2 Jun 2006 @ 13:25: Another two NCN'ers meet !